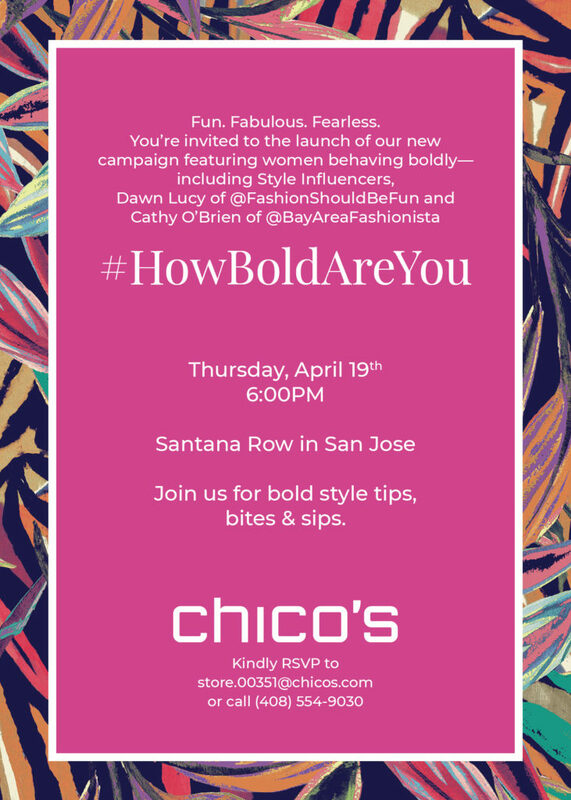 #HowBoldAreYou – Chico’s at Santana Row! So … how bold are you?!! Cathy (Bay Area Fashionista) and I invite you come celebrate women behaving boldly with us! It’s all part of the Chico’s #HowBoldAreYou campaign, dedicated to women living with confidence and style at every age and every size! The fun starts at 6 pm at the Chico’s store in Santana Row in San Jose on Thursday, April 19th! Let’s revel in our fabulousness, Ladies! I know not all of my readers are local to San Jose/Silicon Valley, but for those of you who are, I would be so excited to meet you! If you’re not local, we invite you to join the party via social media. 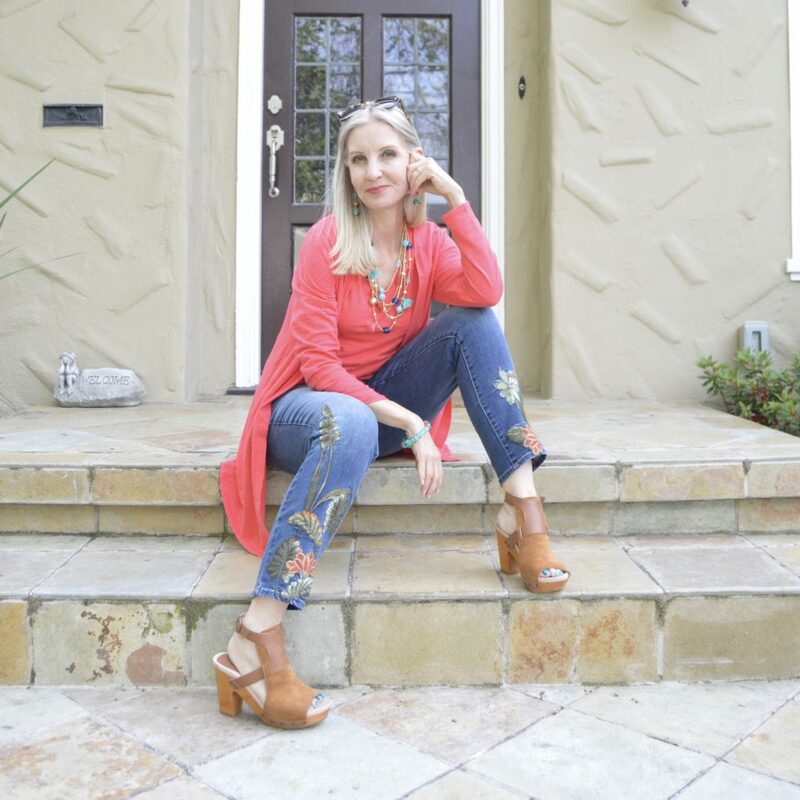 Cathy and I will be sharing style tips for spring, including how to use color and pattern to flatter every figure type. And of course we would be happy to help you style a look from Chico’s spring collection! There will be snacks, drinks, and treats! And hey, why not make it into a girls’ night out? You know Santana Row on a Thursday night is going to be fun! 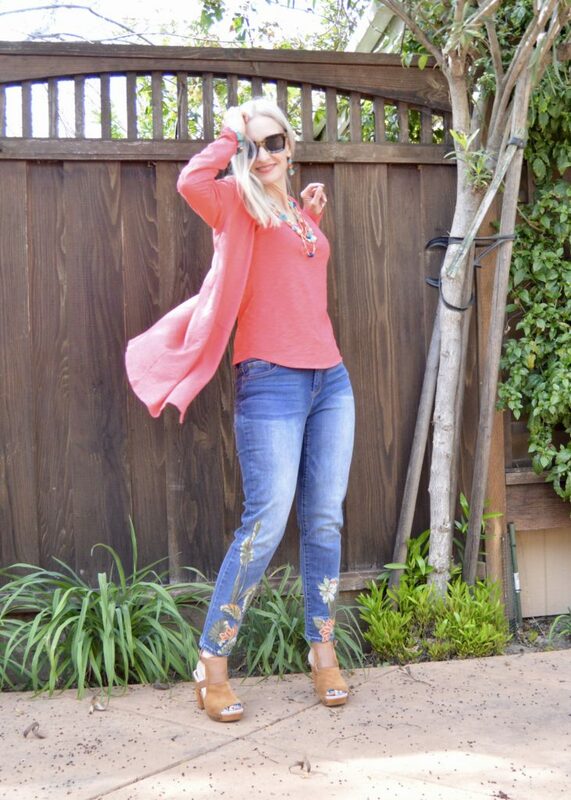 To start the celebrating, I styled this fun look from Chico’s. These adorable embroidered jeans are so on trend for spring! On top of that, they are part of the So Slimming collection, which is becoming my personal go-to for slimming pants and jeans. 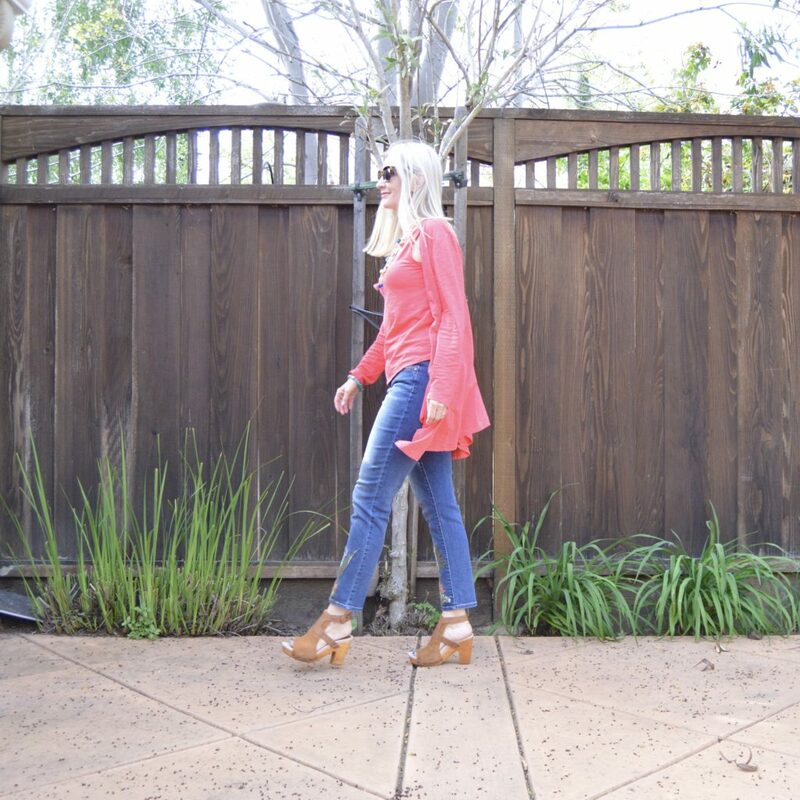 The Cotton Slub Cardigan and matching V-neck tank top are so cool and comfortable. This set comes in five beautiful colors, but I fell in love with this Tropical Punch shade. To elevate the look, I used bold accessories, like this beautiful Charli Multi-strand necklace, Clara Linear earrings, and Clara stretch bracelet. Don’t forget to RSVP to the party!! Email: STORE.00351@chicos.com, call: 408-554-9030 or RSVP on the Facebook Invitation! A celebration of women who are bold, confident, and enjoying the heck out of life at every stage! We’re so excited! You don’t want to miss it! This post is a collaboration with Chico’s. All opinions are all my own. What great fun you’re going to have!! If I lived there, I’d be there in a second!!! I wish you could be there, Jodie! We’re so excited! Thanks so much! I’m loving this “Tropical Punch” color! I will follow it on Social media! Thanks! Such a great pair of jeans! I love the way you styled them! I’m not sure yet if I’ll be able to make it, but I hope to be able to stop by.